Deloris Jean (Elming) Raabe was born August 3, 1938, to Roy and Rose (Carlson) Elming, at a farmhouse west of Lyons, Nebraska. 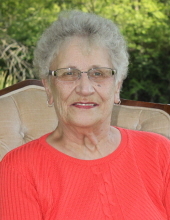 She passed away February 6, 2019 at Legacy Garden Rehab and Living Center in Pender, Nebraska. Deloris spent her life in the town of Lyons. She was baptized and confirmed at First Presbyterian Church in Lyons. Over the years she worked for the Ma Bell Phone Company and for the Lyons Save More Market. She married Robert “Bob” Lee Raabe on November 7, 1969 and they resided in Lyons. Her most important job was as a stay at home mom for her 4 children who were all under the age of 5. She and Bob relished their time together gardening, cooking and spending time with their family. Deloris’ biggest joy in life was her family. She also enjoyed going places with her sister and spending time with other friends. She was preceded in death by her loving husband, Bob; parents; brother, Bernard Elming; brothers-in-law, Robert Smith, Francis Raabe, Donald Raabe, John Raabe, Clinton Barrs, Eldon Schlueter and Duane Dahlgren; sisters-in-law, Darlene Barrs and Joan Schlueter; niece, Marsha Kempcke. She is survived by her sister, Dorothy Smith of Lyons; brother-in-law Dean (Barb) Raabe; sisters-in-law, Elaine Elming, Jean Dahlgren, Judy Raabe; sons, Brian (Cara) Raabe and Travis (Erin) Raabe; daughters, Lynn (Jim) Rumery and Amy West; 8 grandchildren, Jesse, Jaime, Morgan, Shelby, Mason, Madison, Gunner and Katelyn; 3 great-grandchildren, Kayelee, Bentley and Oakley; many other beloved family members, friends and neighbors. "Email Address" would like to share the life celebration of Deloris Jean Raabe. Click on the "link" to go to share a favorite memory or leave a condolence message for the family.